With the automatic foil fusing machine from Therm-O-Type, your business can produce professionally "printed" foiled documents for clients quickly and efficiently. Some of the most popular requests for print shops in recent times have been for metallic foil. 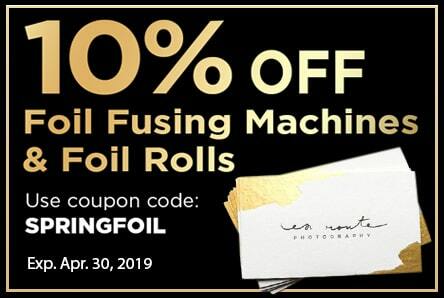 With this quality foiling machine, your business could fill this need quickly, in small or large runs, and without the expensive investment into individual foil stamp dies for every design that comes in. Instead, this fusing machine uses unique toner adhesive foil that sticks the dry toner used in most copiers. When applied to smooth papers, this foil produces a clean and bright finish that looks great on wedding invitations and announcements, business cards, wall prints and more. Adjustable heat and speed settings let you customize the machine to the needs of your specific application for more versatility. A good starting point is normally about a 40% speed setting at 255°. With a huge selection of foil colors and patterns available, there is really no limit to what you can do. Just attach it to a minimum 80psi air compressor and start using the foiling machine. Buy the Therm-O-Type automatic Foil-Tech foil fuser online today, and start creating professional and perfectly finished foiled pieces for your business. This fusing machine is compatible with our 24 x 500' foil rolls featuring 1" cores, however, the rolls need to be cut down to the allowed 14 ½". width or smaller first. ① If the tips of your design are missing foil, then settings are too slow or too hot. ② If there is incomplete foil in solid areas, then settings are too fast or too cold. The "foil fusing" process bonds foil to toner image areas that have been imprinted with a copy machine or laser printer, eliminating the need for a foil stamping die. The Automatic Foil-Tech Foil Fuser can be attached to any air compressor that offers at least 80psi, and is the most efficient and popular Foil-Tech model. It makes it easy to add professional brilliance to invitations, award certificates, business cards, letter head and more. Once the Automatic Foil-Tech has reached the correct fusing temperature, the paper feed is activated. A sensor detects the paper and automatically engages the impression mechanism. This mechanism will automatically disengage as the last sheet is run through the machine. This system assures minimum foil waste. Sheets up to 14 ½" wide by up to two feet long can be run through the machine. When running 11" long sheets through the machine, up to 1,500 sheets per hour can be produced. Fused sheets are delivered into a receiving tray and used foil is rewound for disposal. Variable speed and temperature settings ensure high quality fusing on various paper stocks. In this video we explain what foil fusing is and explain how to use the Therm-O-Type Automatic Foil-Tech Foil Fuser to create beautiful foil images without expensive foil stamping equipment. We explain the additional accessories available and how they can potentially triple your foiling speed, offering two-sided foiling application in one pass with up to two rolls on one side, and one roll on the other. Foil Fusing, the process of bonding foil to a toner image, printed with a copy machine or laser printer has been around for many years. But, foil fusing process allows beautiful flat foil images, and texts to be created without the need for a special dye, expensive foil stamping equipment, complex make-ready and a skilled operator. The basic Foil-Tech machine is configured to support a single foil roll. Two additional foil unwind and rewind supports can be added if desired. With the optional foil, unwind and rewind supports added, two rolls of foil can be fused to the top surface of the sheet and one roll can be fused to the bottom surface of the sheet in a single pass. To operate the automatic Foil-Tech, the appropriate color and foil roll width is installed in the machine. Paper is then loaded into the feeder. Sheets up to 14-1/2" wide by up to 2' long can be run through the machine. Once the desired fusing temperature has been reached and the speed control has been set, paper feed is activated. As paper is fed into the machine, a sensor automatically engages the fusing mechanism. Both the paper and foil are heated as they are conveyed through the fuser. During the fusing process, foil is bonded to the toner image areas on the sheet. After fusing, the paper is cooled and waste foil is peeled from the surface of the sheet.